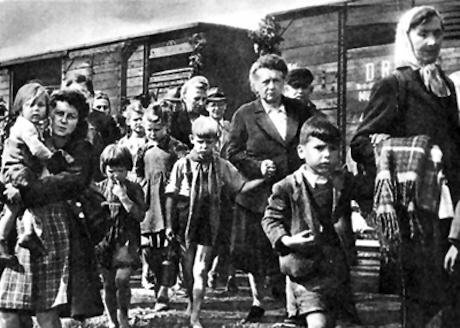 Flight and expulsion of Germans from Poland after World War II. Wikimedia/public domain. "It is a rare event for international lawyers to overwhelmingly agree on the content, scope and interpretation of international law". This remark by Başak Çali, Director of the Center of Global Public Law, captures well the events, during and shortly after, the Annual Conference of the European Society of International Law. As a result of a conference session on the refugee crisis, an open letter was drafted, and within 48 hours signed by over 674 lawyers and leading experts in the field. Due to the overwhelming demand and the on-going discussions at EU level, the letter was reopened for signature and is now supported by more than 900 international lawyers including academics from all the top universities in the world. The Open Letter addressed to 'the peoples of Europe, the European Union, EU Member States and their representatives on the Justice and Home Affairs Council' makes an important intervention because it does not argue on the basis of compassion or morality, but at the level of international legal obligations, a point that has been neglected in the public debate. As Oxford's Cathryn Costello was able to report, on 30th September, the office of the President of the European Commission, Mr Jean-Claude Juncker, responded to the Open Letter explaining that the Member of the Commission responsible for Migration, Home Affairs and Citizenship, Mr Dimitris Avramopoulos ‘is looking into the points you have raised and will respond … rapidly’. - Meet their obligations of international responsibility-sharing, to resettle significant numbers of refugees and provide aid to countries hosting large numbers of refugees. - Abandon those policies preventing safe and legal access to protection with regards to those seeking refuge in Europe. The UNHCR estimates over 2,860 people have died at sea trying to get to Europe this year alone. Suspending carrier sanctions and issuing humanitarian visas would largely prevent the need for those seeking refuge to make dangerous journeys. - Respect and protect the human rights of those seeking refuge once they are in Europe, including by enabling them to access asylum procedures or ensuring safe passage to countries where they wish to seek international protection. - Immediately suspend Dublin returns of asylum-seekers to their first point of entry, but ensure that its rules on family reunification are implemented fully and swiftly. - Relocate asylum-seekers and refugees in a manner that respects the dignity and agency of those relocated, and increases Europe’s capacity to offer protection. - Replace the Dublin System with one that accords with international human rights law and respects the dignity and autonomy of asylum-seekers, and supports international and intra- European responsibility-sharing. - Implement fair and swift procedures to recognise all those in need of international protection. - While claims are being examined, afford those in need of international protection, at a minimum, the reception conditions to which they are entitled in international human rights and EU law. - Respect the right to family life, including positive obligations with regard to family unity, facilitation of swift family reunification and family tracing. - Treat all refugees, asylum-seekers and migrants with dignity and respect, respecting and protecting their human rights, irrespective of status. The obligations outlined are part of international refugee law, a body of International Law that evolved in the aftermath of WWI and WWII around the protection of migrants and refugees. The 1951 Convention on the Status of Refugees and its 1967 Protocol are key instruments and by 2015 148 states are party to one or both of these instruments. Additionally, the principle of non-refoulement is part of customary law and prohibits the return of a person to a country where her or his life or freedom is threatened. In the EU, these international legal obligations have over time been severely undermined. A border regime that is designed to deter entry into the European Union forces many onto a perilous and often deadly journey over the Mediterranean Sea. International law does not have the mechanisms to enforce compliance by states so such initiatives remain an important moral force. Let us not forget the legacy of two world wars and our common humanity. 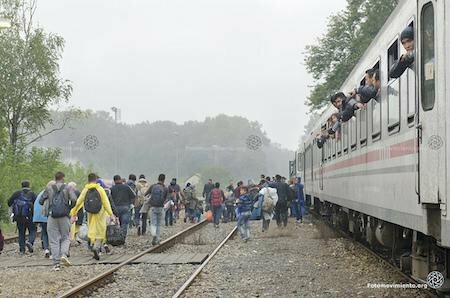 Refugees at Spačva train station, Croatia, 2015. Fotomovimiento/Flickr. Some rights reserved. In particular, we express our horror at the human rights violations being perpetrated against thoseseeking refuge, in particular the acts of violence, unjustified coercion and arbitrary detention. - As regards those seeking protection in Europe, abandon those policies which prevent safe and legal access to protection. The UNHCR estimates over 2,860 people have died at sea trying to get to Europe this year alone. Suspending carrier sanctions and issuing humanitarian visas would largely prevent the need for those seeking refuge to make dangerous journeys. -Relocate asylum-seekers and refugees in a manner that respects the dignity and agency of those relocated, and increases Europe’s capacity to offer protection. - Replace the Dublin System with one which accords with international human rights law and respects the dignity and autonomy of asylum-seekers, and supports international and intra-European responsibility-sharing. - Implement fair and swift procedures to recognize all those in need of international protection. Anna Liguori, University of Naples "L'Orientale"